When posed with the question if Friday night’s run at the Knight Before the Kings Royal was a nice confidence booster after struggling a bit throughout the 2018 season Greg Wilson did not mince words. Wilson, from Benton Ridge, Ohio, had not scored a top five finish during his third year on the World of Outlaws Craftsman Sprint Car Series circuit until Friday at Eldora. Wilson used some home cooking and a visit to his favorite race track to spark a run from 14th starting spot up to second. With the struggles his steam had endured and his high regard for Eldora Speedway Friday’s performance was huge for Wilson. Wilson is a driver whose passion for the sport is always evident. That passion came out in a big way on Friday when Wilson commented on what he felt was a perfect race track. Wilson would like to see more tracks slick off in the same manner Eldora did on Friday. “The cars are equal. You get a multi groove race track you see passing, you see slide jobs, you see a guy coming from the back, you see a guy coming from the middle, I thought that’s what sprint car racing was about. I remember as a kid coming here and this was what Eldora was like. It didn’t have a big plowed up cushion, it wasn’t wet across, it was slick to the fence and Steve, Sammy, and Doug Wolfgang put on sliders for the whole race. Right here tonight that’s what you saw and that’s what its about. The performance capped off several weeks of big changes for Wilson’s team including a switch to DRC Chassis and a different power plant from HP Engines in Pennsylvania. Even with those changes helping with his best run of the season on Friday with a history of running well at Eldora including his first career World of Outlaws feature victory here in 2014 Wilson still feels his program has more gains to make to perform well in Saturday’s Kings Royal finale. Even with the struggles during the 2018 season Wilson’s partners with his race team have stuck behind him. With the unique format for Saturday’s Kings Royal program that features six heat races with a five-car inversion often lends itself to a degree of unpredictability that can help some of the smaller teams like Wilson’s that run well at Eldora. The dramatically slick race track on Friday produced dramatically different results compared to Thursday’s program. Winner Donny Schatz was the only driver that finished in the top five in both features. On the other end of the spectrum Kerry Madsen and Brent Marks didn’t make the feature on Friday after finishing in the top five on Thursday while Wilson was sixth in Thursday’s C-Main before his second-place feature finish. Of the eight drivers that joined the field on Friday that did not compete on Thursday Carson Macedo was the only one that made the feature, scoring a seventh-place finish. Friday’s heat races were not lacking for any action.The second heat race was an eventful affair with several contenders running into problems and one young star benefitting from the mishaps. On the initial star Joey Saldana and Trey Starks were racing for position when they made contact and Starks bounced around, somehow not turning the car over. Starks was able to restart at the tail of the field. On the subsequent restart Brad Sweet and Saldana made contact racing off turn two with Saldana getting into the fence. Jac Haudenschild was collected in the incident and unable to continue in the heat race.The incidents moved Giovanni Scelzi up to the second row and was able to capitalize on others misfortune to transfer into the feature. Rico Abreu had a pair of slide jobs that memorized the crowd during the sixth heat race on Friday night. Abreu made a two for one pass in the early stages of the heat in turn three diving under a pair of cars that electrified the crowd. Abreu followed that up by a last lap slide job in turns one and two on Paul McMahan the win. The heat race success did not transfer over the feature where Abreu finished in 17th position. One of the lighter moments of Friday’s program featured Aaron Reutzel’s son Carson coming up to draw for him, proclaiming he was going to draw the outside front row for his father, and managed to draw that number. 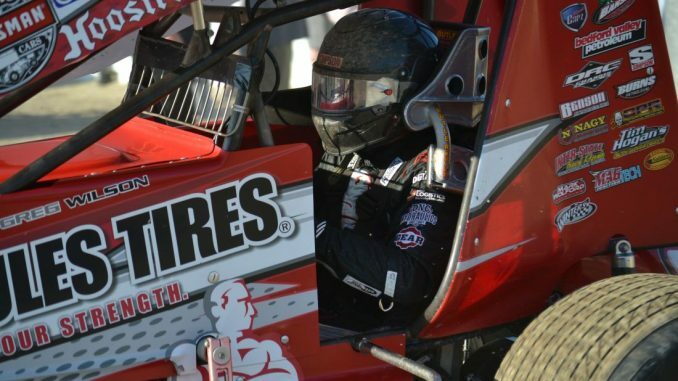 Sammy Swindell’s time was disallowed on Friday when it was discovered by race officials he did not have his head and neck restraint on while qualifying. Swindell finished 9th in his heat race and scratched from the D-Main.